What is CBD (Cannabidiol) and CBN (Cannabinol)? Both CBD (Cannabidiol) and CBN (Cannabinol) are chemical compounds known as cannabinoids. Both forms of cannabinoids interact with receptors inside the brain and both of them will not get you high in the conventional sense of the word (like THC). Both are used to treat same kind of medical issues. They have a lot of the same benefits and can be used to treat similar medical disorders. CBD or Cannabidiol, is found in many strains of cannabis at low levels. Popular benefits of CBD include relief muscle pain, chronic tissue pain, inflammation and convulsions. It is known to inhibit growth of cancer cells in combination with THC. Cannabidiol can be consumed by the body in multiple ways, like orally by mouth, inhalation of cannabis vapor or smoke or as an aerosol spray into the cheek. It is usually supplied as an oil consisting of only CBD as one of the active ingredients (no terpenes or added THC), dried cannabis, capsules, CBD-dominant hemp extract oil or as a prescribed liquid solution. Several uses of CBD include; could reduce anxiety and depression, can relieve pain, can alleviate cancer related symptoms, reduces acne, might have neuroprotective properties, could benefit heart health, anti-tumour effects, diabetes prevention, substance abuse treatment, antipsychotic effects and anti-inflammatory qualities. CBN or Cannabinol, is an oxidative degradation product of Tetrahydrocannabinol (THC), usually created when THC is exposed to Ultra violet light and air over time. Cannabinol (CBN) possesses psychoactive properties, but not as similar as THC. CBN shows solubility in a fatty body as water shows rejection to it. CBN possesses a special relationship with THC. This is because CBN does not come directly from the cannabis plant. Instead, it develops from the exterior oxidation of THC. 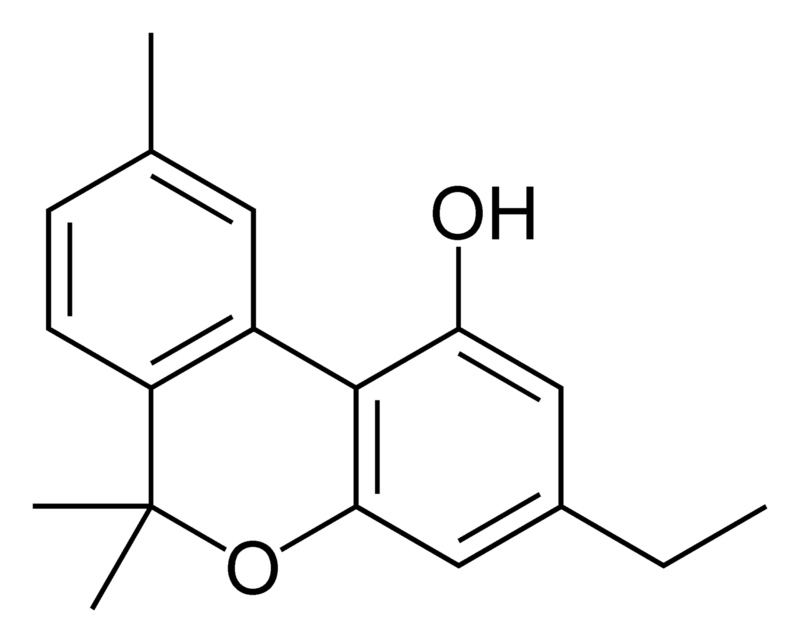 It can also be said, THC leaves CBN (Cannabinol) at the time of its degradation. When the cutting of weed occurs and it is, THC finally becomes CBN. Very small percentage of CBN can be found in the cannabis plant in comparison to other cannabinoids. It has indicant like effects and also reduces inflammation and pain. CBN is produced by the method of aging and decarboxylation and has plays a significant role in many medicinal cases. CBN induces little or no intoxicating effect. Benefits of CBN include; pain relief, anti-convulsive, acts as an appetite stimulant, promoter of bone cell growth, anti-inflammatory effects and antibacterial. Cannabidiol is a non-psychoactive compound that comes from hemp plants. CBN (Cannabinol) is a non-psychoactive cannabinoid present only in trace amounts in Cannabis, and is mostly seen in aged Cannabis. It is neuroprotective, anti-ischemic, anti-spasmodic, immunosuppressive, anti-emetic, analgesic and anti-psychotic. The one con of CBD (Cannabidiol) is that it might not work for everyone. The con of CBN (Cannabinol) is that it has not been as fully researched as Cannabidiol, so it has not yet been discovered and explored to its full potential. It does not cause any stomach problems. It can show interaction with other drugs, and in case you are on any medications, you need to be extra cautious and careful and consult your doctor before consuming CBD. The only side effect is that it can make you drowsy and lethargic. It is legalized in 50 states of USA. It is not included in the United Nations’ Narcotic Drugs Convention on Psychotropic Substances and in the Scheduled Controlled list of substances. CBD is not at all psychoactive, does not cause euphoria and so it will not bet you high. The strains high in CBD have very low THC content. CBN is mildly psychoactive and research has also shown that it is a potent sedative. However, it does not produce high like THC. Dr. Amita Fotedar -Dr. "Difference Between CBD and CBN." DifferenceBetween.net. 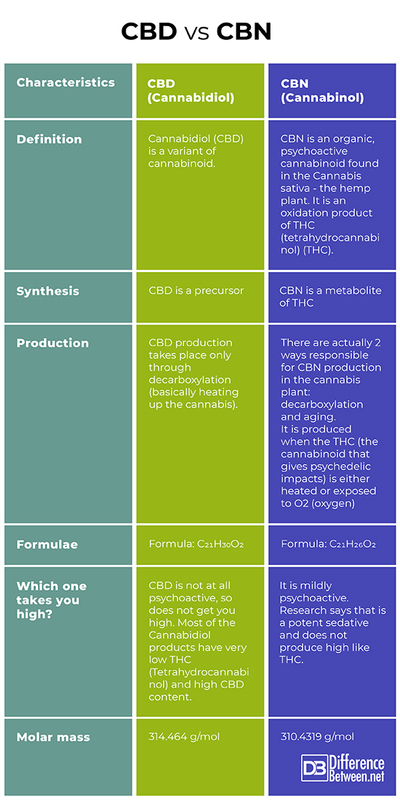 January 29, 2019 < http://www.differencebetween.net/science/difference-between-cbd-and-cbn/ >. Bridgeman, M. B., & Abazia, D. T. (2017). Medicinal cannabis: history, pharmacology, and implications for the acute care setting. Pharmacy and Therapeutics, 42(3), 180. Fraguas-Sánchez, A. I., & Torres-Suárez, A. I. (2018). Medical Use of Cannabinoids. Drugs, 1-39. Madras, B. K. (2015). Update of cannabis and its medical use. Report to the WHO Expert Committee on Drug Dependence (http://www. who. int/medicines/access/controlled-substances/6_2_cannabis_update. pdf.